This application is for a Pontiac GTO that came equipped with a deluxe dash in which there is dash fascia separating the radio dial from the push-buttons. The RetroSound® Redondo radio is the only made-for-iPod®/iPhone® radio available for your classic 1968-72 Pontiac GTO. Redondo looks like the original factory radio, but includes all the features of a modern car stereo. Hands-free Bluetooth® phone operation is built-in, and you can stream audio wirelessly from your iPhone® or any Android®-based phone. It features 32,000 color LCD display, two sets of RCA pre-outs and subwoofer output. Two rear auxiliary inputs for portable devices and two rear USB inputs for iPod® or a USB flash drive are included. Redondo has separate radio display and push-button assemblies that are independently adjustable thanks to RetroSound's patented InfiniMount system. 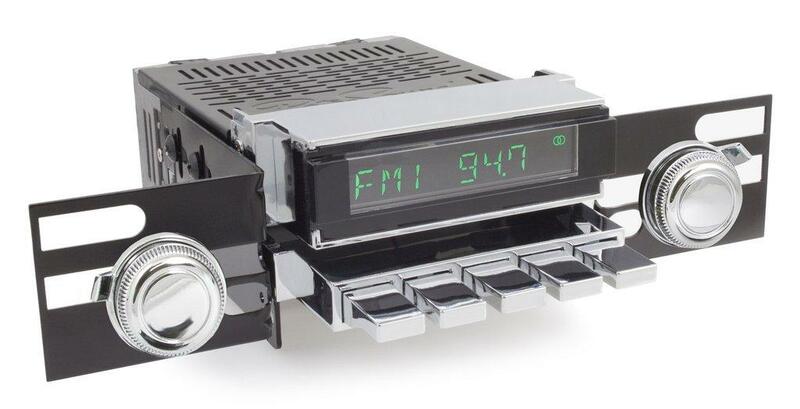 This is the most technologically advanced radio ever produced for vintage Pontiac vehicles.